GRS manages several observatories, among them the Fundamental station Westerbork. There we have a specifically designed bunker for gravity observations. Other designed observatories are the GNSS lab in Delft (on top of the VSL building), our part of the Dutch Permanent GNSS Array (DPGA) observatories, and our share in the Cabauw Experimental Site for Atmospheric Research (CESAR). The world-class CESAR Observatory in Cabauw (PI Prof. Russchenberg) is widely recognized as one of the most advanced sites for atmospheric studies. TU Delft owns and operates the high-resolution atmospheric radar systems IDRA and TARA. CESAR consists of a large set of instruments to study the atmosphere and its interaction with the land surface. 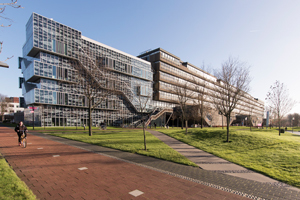 It also serves as a permanent bridge between the participating universities (TU Delft, WUR, TU/e) and research institutes (KNMI, RIVM, TNO, ESA, ECN). Many of the available atmospheric remote sensing instruments located at Cabauw offer unique possibilities for sensor synergy. Measurement equipment is either permanently located at an observatory site for continuous monitoring (e.g., at WAGO), or used for long-lasting campaigns (several months or years), or shorter campaigns (days to weeks). The laboratory provides state-of-the-art GPS equipment, theodolites, leveling, and laser distance measurement devices. Terrestrial acquisition is also carried out using digital cameras and a Laser Scanner. The equipment includes GNSS receivers, several relative gravimeters, an FG-5 absolute gravimeter, a 3D laser scanner, a rainfall radar and various other surveying attributes. The GRS laboratory possesses some powerful computer equipment with data storage facilities. We also use the Sara super computing facilities and Oak Ridge Leadership Computing Facility (OLCF). GRS has access to a local cluster, mainly used for traditional HPC applications and a low-latency grid-network for special GPU and visualization applications. The Virtual Reality lab (together with EWI). The world-class CESAR Observatory in Cabauw (www.cesar-observatory.nl, PI: prof. Russchenberg) is widely recognized as one of the most advanced sites for atmospheric studies. TU Delft owns and operates the high-resolution radar systems IDRA and TAR A. The OMI satellite instrument (PI: prof. Levelt) and the new TROPOMI instrument (PI: Veefkind, to be launched in 2016) gives detailed information on global trends in regional and global air quality and climate related issues. The Rotterdam testbed, including a network of weather stations, high-resolution rainfall radar and in situ sensors, and remote sensing sensors for air quality is under development. The PARSAX S-band radar at the campus of TU Delft. The KNMI Parameterization Test Bed. Results of a variety of numerical models, ranging from GPU-accelerated large-eddy simulations, limited area models and single-column model versions are compared continuously with in-situ data as obtained from the CESAR Observatory.